Published: Aug. 12, 2016 at 12:52 p.m. Updated: Aug. 12, 2016 at 01:51 p.m. Okay, so last week I said we were only a few days away from actual football. Oops. But by the time you read this, we will have actually really had really real football really played. I hope. Anyway, here's the Stock Watch. 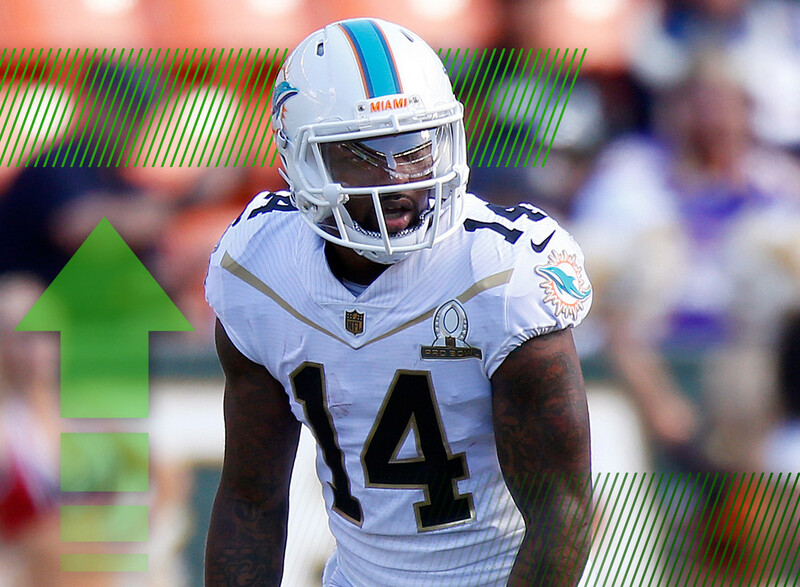 If you're a fan of PPR fantasy football, you already know about the greatness of Jarvis Landry. But even if you play in standard leagues, you should be plenty excited about Adam Gase saying that the NFL is a "10 yards and under" league. That plays well for a receiver who averaged just 5.6 air yards per reception last season. Much like Julian Edelman in New England, Landry might not rack up a ton of yards but he'll have plenty of catches. Now if he could just get in the end zone a little more often. There have been questions all summer as to how Matthews would fit in new coach Doug Pederson's offense. Combine that with questionable quarterback play in Philly and the young receiver wasn't exactly flying up draft boards. Now Matthews is expected to miss up to a month as he recovers from a bone bruise in his knee. Both sides need for Matthews to be healthy and productive, but the situation in training camp is making his learning curve steeper and making fantasy managers more nervous. I loved Jones when it looked like you could get him four rounds later than Golden Tate yet still expect a similar amount of fantasy production. Now it looks like Jones could end up as the No. 1 receiver in the Lions offense. That's going to undoubtedly rocket him up draft boards as we get closer to the start of the season. Or ... you all could just continue to wait until the double-digit rounds to draft Jones so I can continue to get good value. Yes, it's all about me. I was pretty dubious about Matt Jones being the undisputed top running back in Washington. That anxiety has borne fruit now that it looks like Keith Marshall could be in line to join Jones in a committee. It's doubtful that anyone was banking on Jones to carry their fantasy running back position but now he should be downgraded if he isn't going to consistently see the majority of the touches. Don't worry, I don't have any hot takes about fading one of the best receivers in this year's draft class. But it's probably worth tamping down any outsized expectations for Treadwell once you hear that he's not quite ready to be the Vikings No. 1 receiver. That day is probably still coming -- and coming very soon -- but in the meantime, it's time to start looking a little more seriously at Stefon Diggs as the first Vikings receiver off the board. Before you even ask ... yes, I'm still totally on board with C.J. Anderson as a bounce back candidate this year. This is more about Booker putting a lock on Denver's RB2 role and pushing Ronnie Hillman further into the shadows. The rookie should have a gig as the pass-catching back in the Broncos offense which at least gives him a little value, especially in PPR leagues. I feel like I've made my feelings on Gordon perfectly clear and it seems like most of you have listened since Gordon is currently the WR50 on NFL.com. But there appear to be a few people still taking some mid-round fliers on the Browns receiver. Would it change your mind to hear that he still has to work himself into football shape? That's going to be hard to do if he's not able to get back on the field. If you want to keep spending more than a last round pick on Gordon, that's none of my business. Do you hear that sound? It's Clive Walford sneaking up on you to have a surprising fantasy season. The second-year tight end has earned rave reviews in camp from quarterback Derek Carr while offensive coordinator Bill Musgrave says he wants Walford to be a big part of the offense. Get excited everyone! Maybe this is the start of tight ends starting to make a fantasy impact earlier in their careers. We can hope, right? The idea of the athletic Green playing a big role in the dynamic Steelers offense has us all agog. The idea that he's still rehabbing with no definite timetable for his return to the field does not. When he's able to get healthy and resume working with Ben Roethlisberger, we can upgrade him back to his previous status. Until then, it's probably time to fade Green just a little bit. Yeah, I'm hyping Blaine Gabbert. So what? Fight me. It looks like Gabbert is on his way to winning the starting quarterback job for Chip Kelly's offense. If you buy Matt Harmon's theory that there is more fantasy value on that roster than originally assumed, then the trigger man could be a sneaky QB2 option this season. Considering his draft price, you're pretty much getting Gabbert for next to nothing.